Elder Robert D. Hales (b. August 24, 1932- 84 years ago today!) 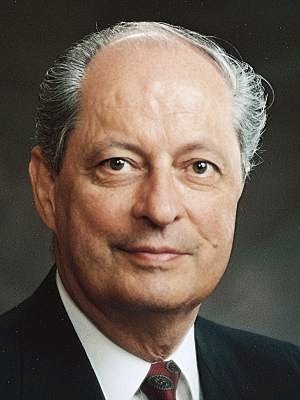 served as a Seventy from 1976 to 1985, when he was called as a member of the Quorum of Twelve Apostles. "Whether we are young or old, what we do today determines the service we will be able to render and enjoy tomorrow. As the poet reminds us, 'Of all sad words of tongue or pen, the saddest are these: "It might have been!"' (John Greenleaf Whittier). Let us not live our lives in regret of what we did or did not do!" I thought the claim of the opening sentence of this excerpt was interesting. A greater desire to serve one another is a natural result of increased desire to learn and live the gospel. That makes sense, since the essence of the Lord's message was to love God first, but then to love one another. Once a Christian truly understands that vision, he will be consumed with the desire to serve and bless those around him. 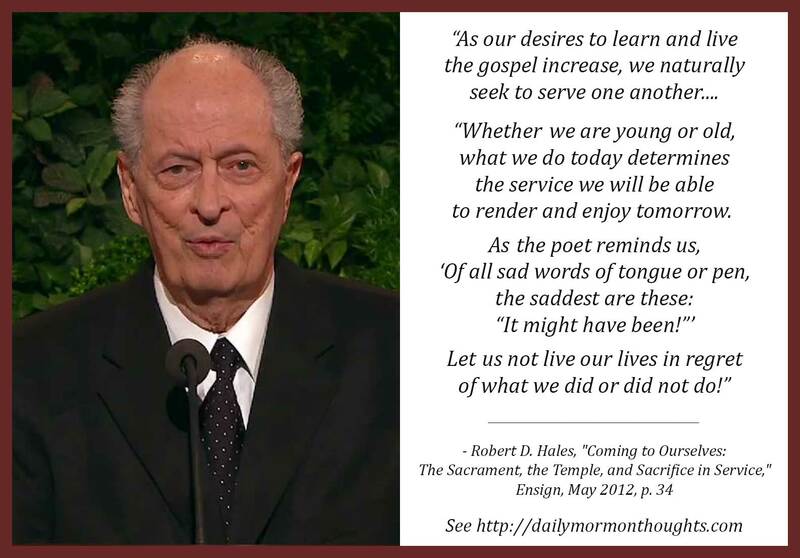 And Elder Hales believes that the youth of today have a natural tendency to serve others and "make a difference in the world" as they seek the joy those actions bring. 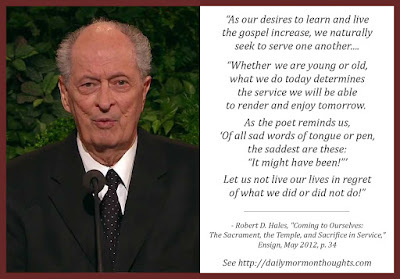 The call, then, is to not miss the opportunities to serve; to be "anxiously engaged" in doing all we can to help and encourage others, and bless as the Savior would.